It takes a lot of dedication and commitment to be a professional dancer. For those few moments performing on stage, you need to be able to hone your body to perfection, providing your audience with a flawless exhibition of your talent and skill. You have to transport both yourself and the people watching you into another world- one filled with music, movement and motion. And most of the time, this is a one-off experience, which will never be captured and visited again by anyone present. Unless you have a photographer on site, or someone to film the performance, that particular dance moment will be lost to anyone who didn’t witness it with their own eyes. That is why this book is so important. 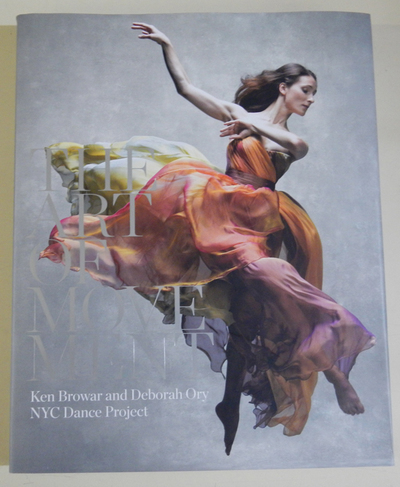 Created by photographer couple Ken Browar and Deborah Ory in their studio apartment, this book captures the movement of some of the best current dancers, from companies around the world. When one of their young daughters expressed an interest in dance, and wanted to decorate her room with images of her dancing heroes, the couple were perplexed to find that only older photos, of dancers from the past, were easily available. Using their contacts in the creative industry, they decided to form the NYC Dance Project, and started taking photos of accomplished dancers in their element- making sure to capture each dancer’s spirit, fine lines, outfits and passion within each photograph. The project soon grew and the end result was this book (although they continue to take photographs for their website). Featuring a mixture of black and white, and colour photographs- some spanning across a double page spread, most a single page and several as pages featuring a selection of smaller images- this book captures the true beauty of dance. The skill and talent that is required of the dancers (and of the photographers in capturing each image) is astounding. Each photograph shows the years of commitment and dedication each dancer has given to their art form. The photographs are striking, and are interspersed with quotes from some of the dancers, explaining their passion for dance and the reasons why they love it so much. This is a beautifully photographed collection for lovers of ballet and contemporary dance- created with skill and passion- and would be a worthy addition to the bookshelf of any dance or photography connoisseur.